Following seven years of austerities which have caused employees’ wages to be slashed, stores and companies to close, hikes in taxes and higher prices for everyday goods, more than 40 percent of Greeks are unable to afford to pay their utility bills. 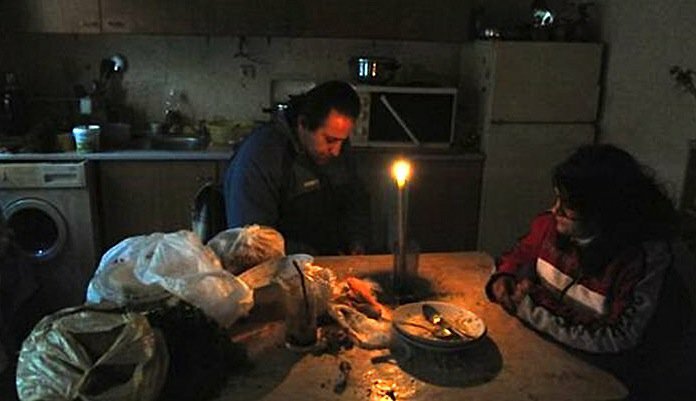 Reuters recently published an article titled: Greece’s Dark Age: How Austerity Turned Off the Lights, highlighting personal stories of how Greeks cannot afford to pay their electricity bills and owe the Public Power Corporation (PPC) hundreds and sometimes thousands of euros. The report emphasizes the strain of living with austerities which caused more than 40 percent of the country’s population to fall behind on paying utility bills — a percentage considerably higher than the rest of Europe — with some 2.6 billion euros owed in past-due bills. Living in the midst of austerities with no end in sight, many Greeks have had to resort to stealing electricity as well, Reuters’ report explains. The Hellenic Electricity Distribution Network Operator (HEDNO) which is in charge of reading electricity meters publicly disclosed figures that are verified cases of power theft, saying there were some 10,600 cases in 2016 — a steep incline from 4,470 cases in 2012. Clever tricks such as using magnets to slow down meters is a commonly used tactic, according to a HEDNO official. The end result is that PPC loses some 500-600 million euros a year due to power theft.